The defending National League Champions are on a roll, having won 8 straight games and creeping up on the first place Braves to within 2 1/2 games of the division lead. The Phillies (56-46) plan to keep the wins coming as they send their new, prized acquisition, Roy Oswalt, to the mound to start a 3-game series against the Nationals (44-58). Oswalt, a 3-time NL All-star, will face Washington right-hander Craig Stammen in the series opener. The Phillies won 2 of 3 games when they visited Washington back in April. Read on for details on the pitching match ups and other key statistics from this series. Friday, 7:05pm. 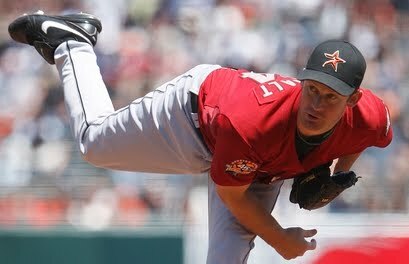 Roy Oswalt (6-12, 3.42 ERA) vs. Craig Stammen (2-4, 5.50 ERA). In 13 career outings vs. the Nationals, Oswalt is 3-2 with a 3.52 ERA. Adam Dunn against Oswalt is 19-for-71 (.268 avg) with 4 homeruns, 11 RBI and 13 walks. In 8 road starts this year, Oswalt has posted a 4-3 record with a 2.61 ERA. In 2 starts against the Phillies, Stammen has allowed 11 earned runs in 6 1/3 innings (15.63 ERA). In 8 home starts this season, Stammen is 1-1 with a 4.94 ERA. Placido Polanco is 4-for-5 in his career against Stammen. Saturday, 7:05. Joe Blanton (4-6, 5.85 ERA) vs. Ross Detwiler (0-1, 0.00 ERA). In 8 road starts this season, Blanton is 1-4 with a 6.62 ERA. In 4 starts at Nationals Park, Blanton is 0-2 with an 8.69 ERA. Josh Willingham and Ivan Rodriguez are a combined 3-for-20 (.150 avg) against Blanton. Detwiler was the Nats' first round draft pick in 2007 and was promoted from Double A Harrisburg last week to fill in for the injured Luis Atilano. Detwiler, a lefty, was 1-6 with a 5.00 ERA in 15 Major League games last season. Sunday, 1:35pm. Cole Hamels (7-7, 3.48 ERA) vs. To Be Determined. Hamels has been excellent lately, posting a 2.79 ERA over his last 10 starts, dating back to June 7th. In 10 road starts this season, Hamels is 3-4 with a 3.62 ERA. In 17 career starts against the Nats, Hamels is 9-3 with a 2.58 ERA and a .222 batting average against. In July, Ryan Howard has blasted 8 homeruns...as many as he had in April and May combined. In 21 career games at Nationals Park, Howard has a .284 batting average with 9 homers and 25 RBI. Jayson Werth is 5-for-7 combined against Stamman and Detwiler. In 13 games since the All-star break, Werth has posted a .333 batting avg. and a .991 OPS. Prior to the break his average and OPS were .282 and .881. At home this season, Adam Dunn is batting .281 in 49 games. Dunn, who leads the team with 24 homeruns has been heavily rumored to be a trade target for many teams this week. MLB's non-waiver trading deadline is Saturday. Ryan Zimmerman is a combined 22-for-77 (.285 avg) with 6 homeruns and 12 RBI against Oswalt, Blanton and Hamels in his career. New PhoulBallz Roy Shirt- Ace Ace Baby!